Our gutter cleaners throughout Wood Green and the South East are trained to the highest level of gutter cleaning and all our gutter cleaning services are completed efficiently and professionally. Blue Sky Guttering Ltd clean and repair and line all types of commercial guttering in Wood Green and all areas in the South East and Home counties. 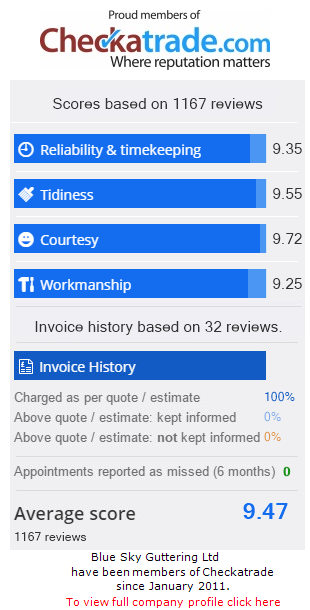 Residential customers in Wood Green contacting Blue Sky Guttering for a quotation will be given an all inclusive fixed price either by phone or email. Copyrights © © 2013- 2019 All Rights Reserved Blue Sky Guttering Wood Green.